MRT dongle software version 2.56, you can use this tool or Windows software without the MRT dongle and this version is working fine for flashing and unlocking any latest Android smartphones. So download the free Android unlock tool which supports all most all new devices from VIVO, OPPO, MICROMAX, XOLO, IBALL, ONEPLUS AND SAMSUNG, along with all Qualcomm, MTK and Spreadtrum CPU based phone unlocking and flashing. 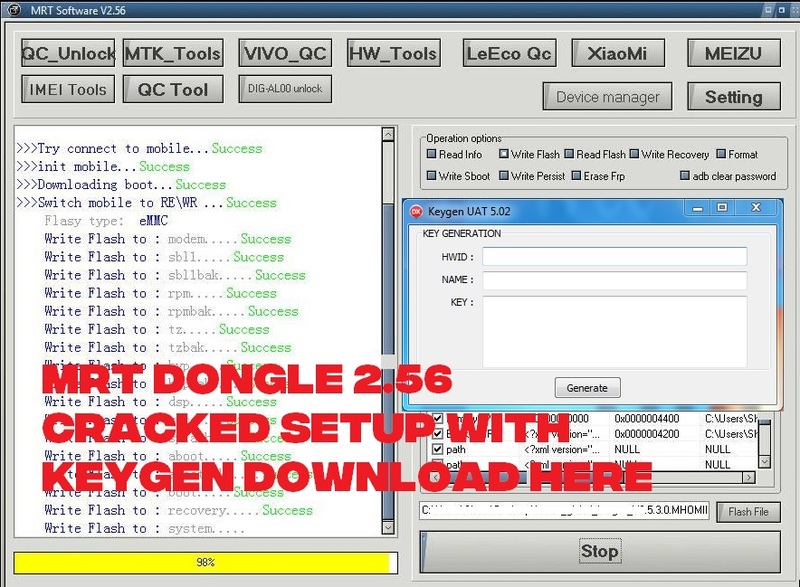 This tool is very useful for Reset or Bypass Factory Reset Protection (FRP) or Google account verification, so here is the free download link for MRT Dongle 2.56 with key gen.
How to Install MRT Software 2.56? Download the software and key gen from the link given below. Unzip the software using the password provided. Now Open the MRT 2.56 Crack Setup and Install it using the Installation Password given in Setup Pass.txt inside the folder. Now Open MRT_2.56 Crack and copy the HWID and Use the KeyGen to generate key. Now copy and paste the key in the activation window. Now Open the MRT_2.56 Crack.exe and it will work fine. MRT Dongle Key Crack and KeyGen Use? This tool is used for unlocking and flashing Android smartphones. Using this version or MRT dongle also supports various devices to unlock FRP, Repair IMEI and it can also fixed all other Mobile software issues. This too is very use full for VIVO and OPPO FRP unlock, flashing and Hard Reset and which supports VIVO and OPPO both Qualcomm and MediaTek CPU to Unlock and Reset. Download free Android flash tool and frp unlock tool crack software with loader or keygen, free download of MRT flash and unlock tool without dongle with activation key. Download the set up file above and you will get the KeyGen inside this folder.